I had Great Pics Photobooth as part of my daughter’s Quinceanera almost 1 wk ago & I have to say they are the absolutely GREAT! This is the 2nd time our family uses them, the first time they were used I did not attend that event but was told by my cousin how great they were, so I gave them a shot & boy was I glad i did that. Maggie always replied to my emails, or call back when needed & did a great job on the image we wanted on the photo prints. The guests at our party even came to me to tell me how great the booth was & how cute the pics looked, at the end of our event I was handed a few print outs done specially for me. The mother/daughter team work so well together & were so sweet & patient with our guests. I absolutely recommend them for any type event. The photo booth was a great finishing touch to complete our event, I guarantee it will complete your event too! What an amazing way to create a fun and memorable atmosphere for any occasion!!! I’ve had this company appear at a Halloween party, a girls nite, and hoping I can book them for my salon party soon. It is too much fun!!!! I would recommend them to anyone looking to enhance any celebration. They customize greetings on the prints to your occasion and have props ready to go! A truly great experience! Great Pics Photo booth is phenomenal! I’ve used them twice now for work functions (one event was 13,000 people!) and they handled it really well! They are extremely professional, helpful, and flexible. I never once had to worry about them because they were constantly following up with e-mails ahead of time to make sure everything was able to be set up properly and that we were on the same page. They are extremely friendly and fantastic to work with and were also friendly to consumers. I will continue to hire them for my company for all photo booth needs! Great Pics Photobooths brought their photo booth to the Big Brothers and Big Sisters of San Diego Barbeque in 2011. 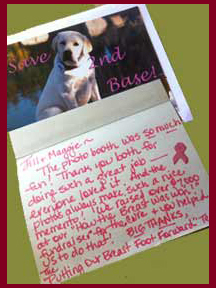 Our photo booth captured some smiles at the Breast Cancer Fundraiser – Put Your Breast Foot Forward. If you are looking for a photo booth for your charity event please call us or send us a request and we will get back to you with a special package.